While Chris Hemsworth may be dropping out of Star Trek 4, it’s not like the guy’s at a loss for major franchises to fall back on, with Avengers 4 and a new Men in Black film both due for release next year. Better yet, Hemsworth can now add another major Marvel character to his résumé, assuming the role of the irreverent star of the Deadpool series while Ryan Reynolds, in turn, fills in as Thor – well, not exactly, but we’ve got some pretty cool fan art that imagines what it would look like if they did. This one’s going to take a little explaining first, though. Yesterday, the Thor lead took to Twitter with a birthday selfie, also featuring his wife Elsa Pataky and a sweet-looking cake with candles ablaze on top. The accompanying caption tagged the current Merc with a Mouth, Ryan Reynolds, in an amusing story of domestic drama. 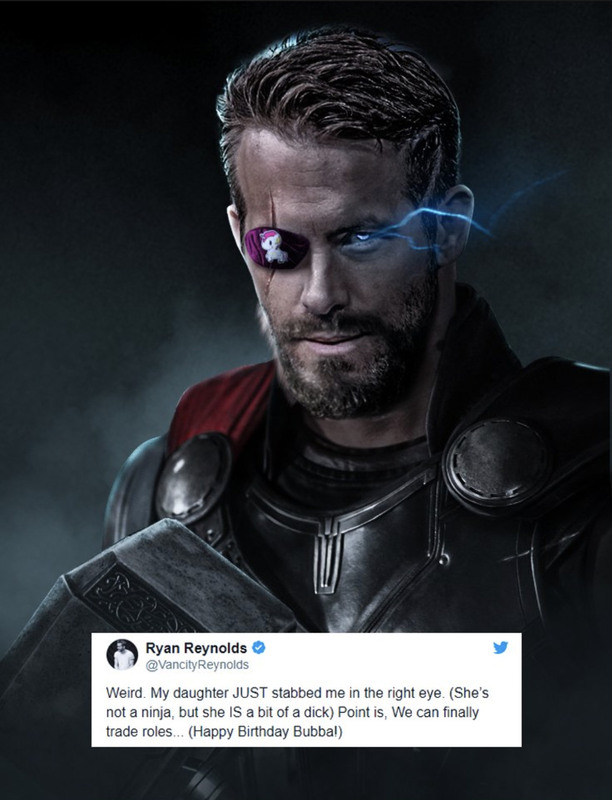 Artist BossLogic has been quick to respond to the exchange with a pair of images that see each actor living out their fantasy, showing a burnt-faced Hemsworth rocking the Deadpool outfit with the burning candles still on him, along with a second picture of Reynolds in the God of Thunder’s garments and a unicorn eyepatch. 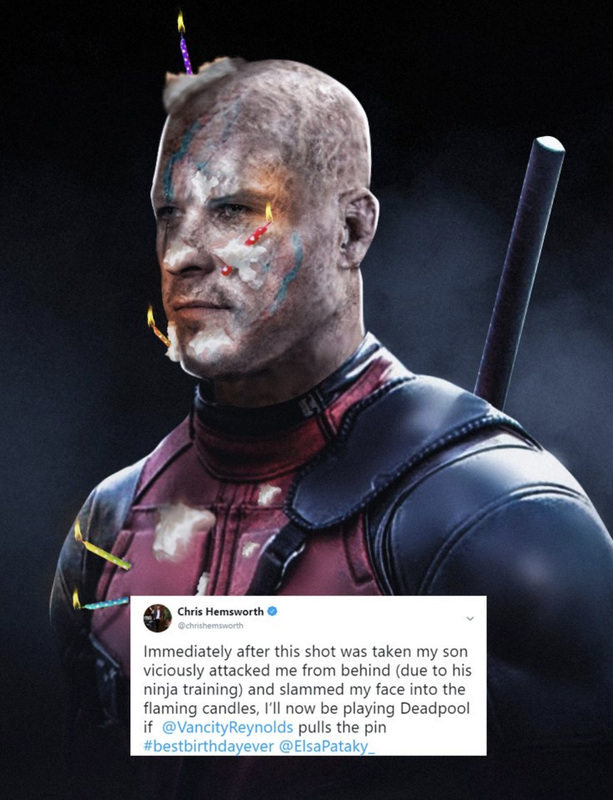 Obviously, this is all fan fantasy, but it’s not out of the question that the son of Odin could be crossing paths with Wade Wilson at some point in the next few years. After all, in the wake of Disney’s acquisition of Fox, Marvel Studios will be free to move the Deadpool saga to the MCU, though it’s still unclear how the foul-mouthed antihero could fit into this relatively family-friendly franchise. Perhaps that’s an issue for another day, but while the long-term paths for both of these characters is a little unclear, you can at least expect to see Thor once more when Avengers 4 comes out on May 3rd, 2019, and Deadpool again in the planned X-Force film.